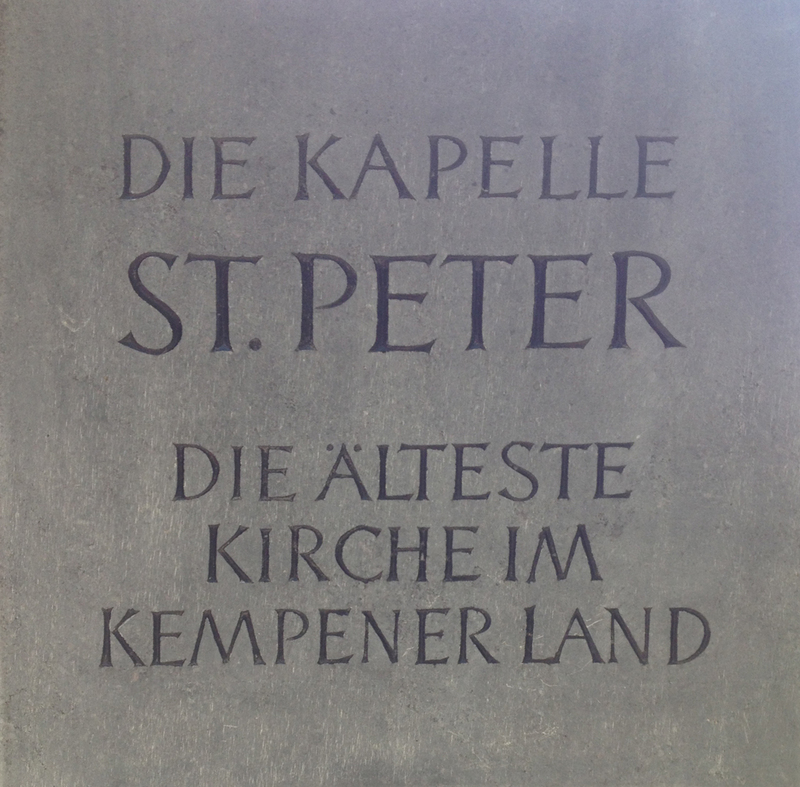 See here for my first blog post on visiting the 105 churches in Kreis Viersen that I have so far identified. 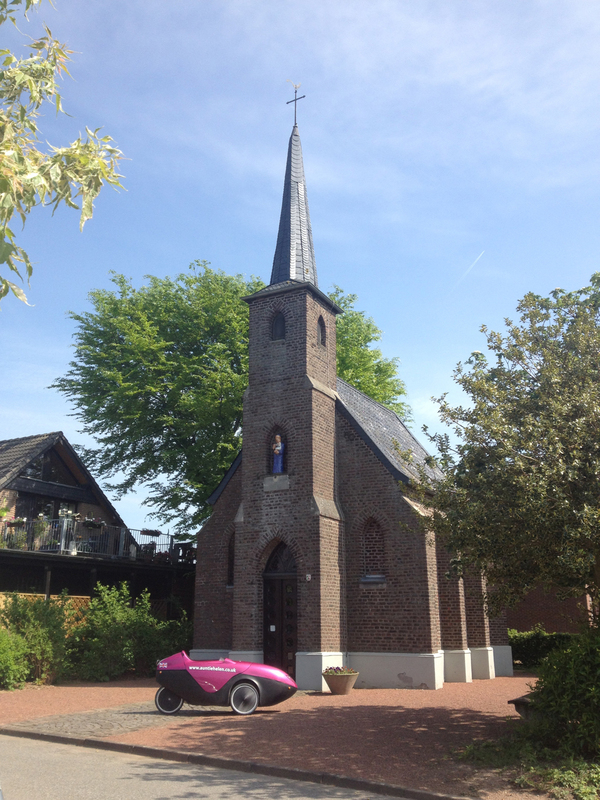 This church was visited on Monday 5 May on a short ride in Penelope the Velomobile (I also visited number 12). I’d seen a sign for this church when cycling past a few days previously but it turned out to be slightly tricky to find as initially I just thought it was a barn. 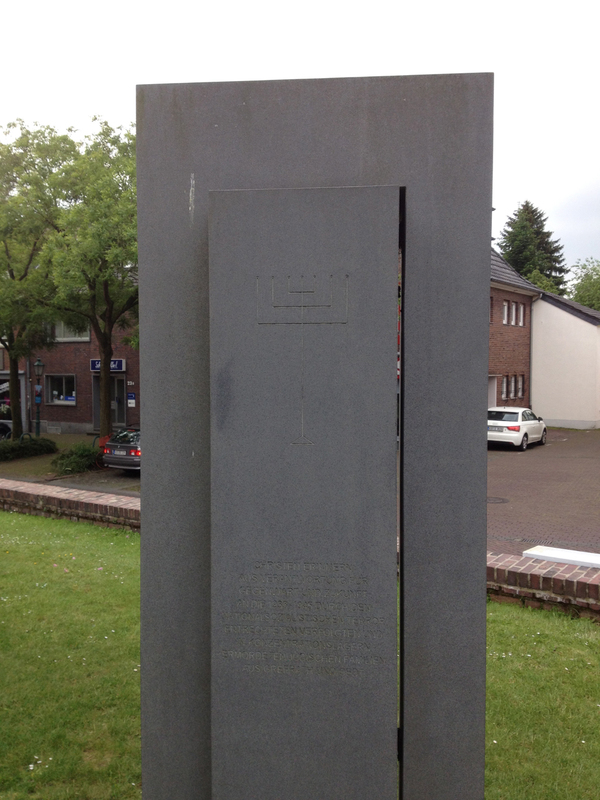 The door (with a sign that it’s a Denkmal or memorial/monument) showed that I had found the right place. The door was closed but a lady came out of the house next door and I had a brief chat. She didn’t know much about the church as she just rents the house next to it but said that it isn’t open for services very often but that the caretaker lives a couple of hundred metres away and I could always ask to have a look round. I didn’t want to disturb the caretaker so just took a photo of Penelope outside before heading off. 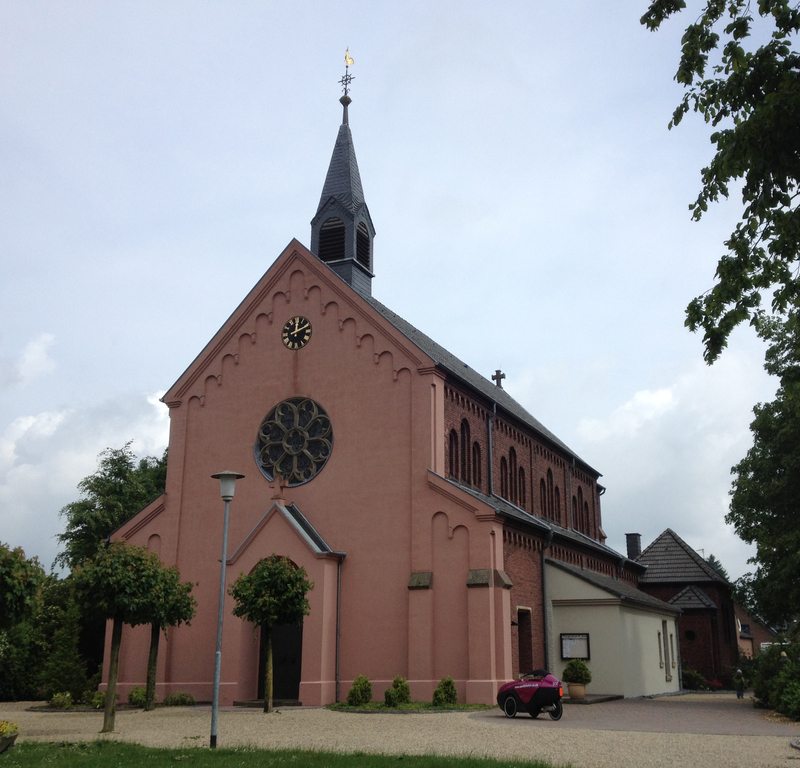 I’ve subsequently found a bit more information on the website of the Kempen Catholic Church: Kapelle Heumischhof. 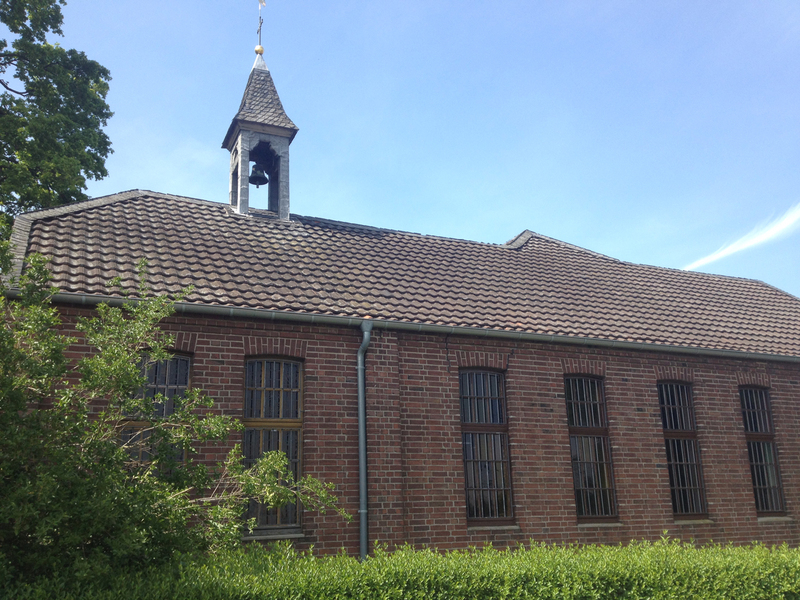 Basically the chapel was originally built in 1908 as part of a planned additional Benedictine Abbey to the one at Mariendonk. However the huge rise in inflation meant that the Abbey couldn’t be built but the chapel at Heumischhof continued to exist and served the rural population as a house of worship and had its own priest. In 1941 it was completely destroyed by incendiary bombs but was rebuilt in the same year. Since the mid-90s the chapel hasn’t had its own priest and services are now only held there on special occasions. 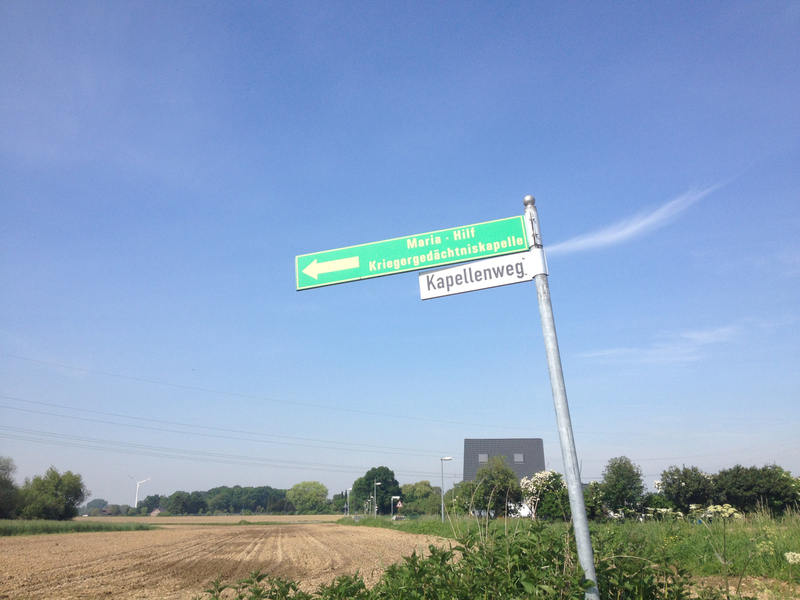 This was less than half a mile from the Heumischhof Kapelle. In amongst a very small hamlet of maybe eight houses I found this rather attractive little chapel. 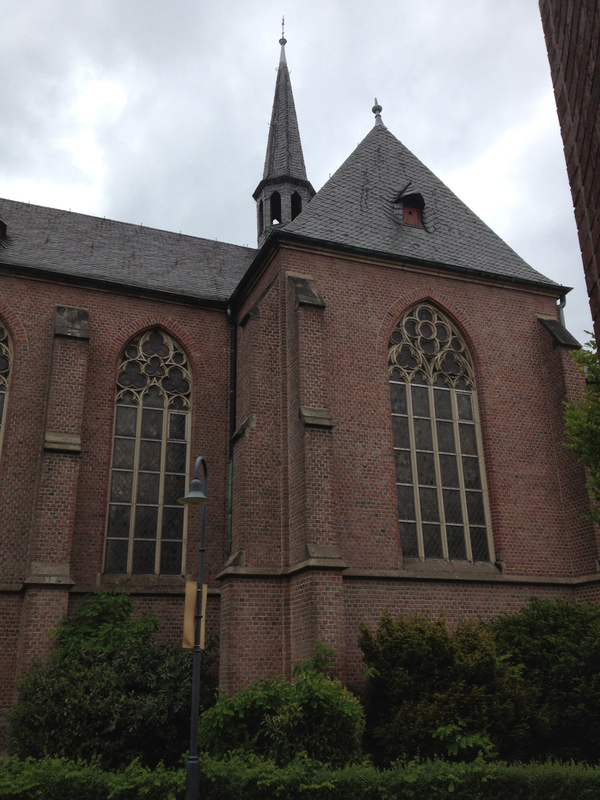 The Denkmal website for it explains that it was built in 1875 in the Gothic Revival style. 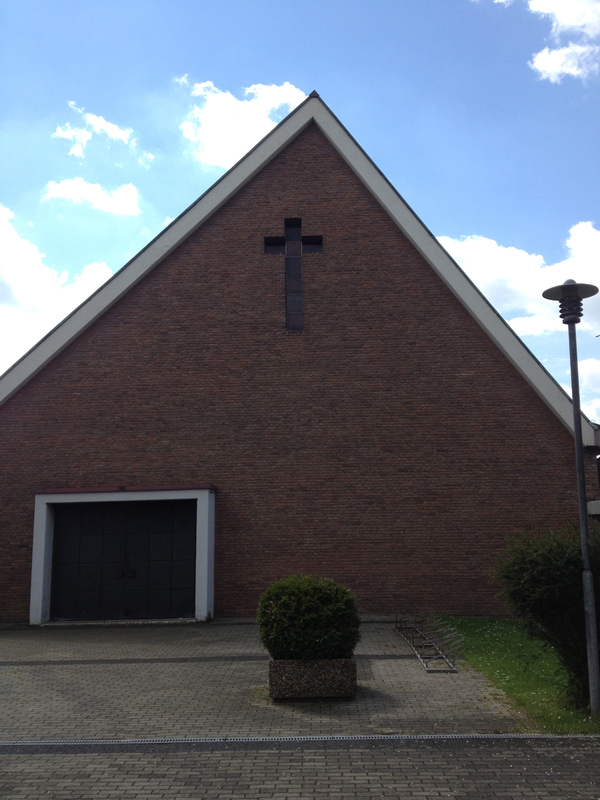 The residents of Ziegelheide had wanted to produce a sign of their faithfulness to the Catholic Church because of the culture wars around the time of the First Vatican Council (1870-71). They called the church Maria-Hilf (Maria-Help) as it was built in honour of Mary, the comforter of the afflicted and helper of Christians. In October 1926 the chapel was turned into a war memorial. The chapel was shut but I attempted to take a photo through one of the windows. It’s surprising it’s taken me this long (five weeks) to visit this church as it’s pretty near, just three and a half miles away, and it’s also linked to the church that I attend in St Hubert (it shares the same minister, etc). 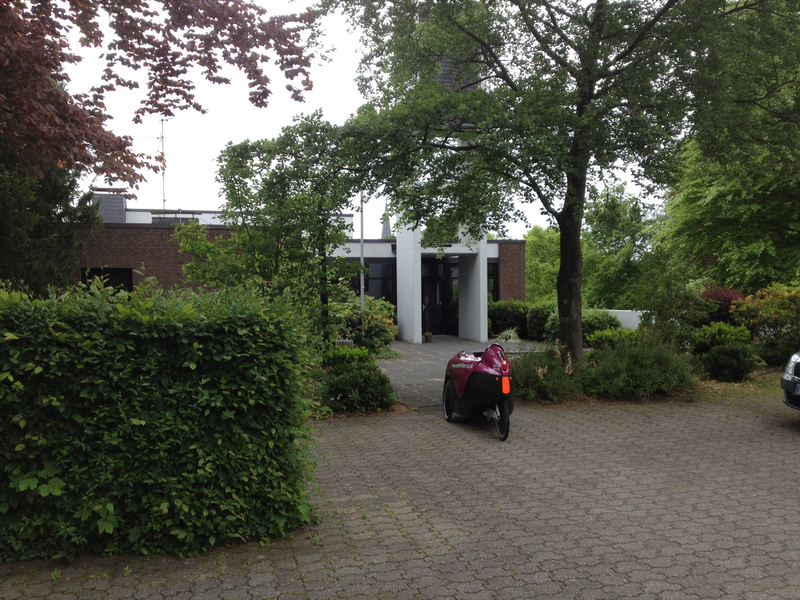 On a rainy afternoon I decided to pop out for a quick spin in Penelope and found myself heading towards Tönisberg. The clue’s in the name – it’s a mountain! (well, not quite, it’s a moraine and not thaaaat high) but I felt like I had enough energy to winch myself up in my heavy velomobile. So I did. 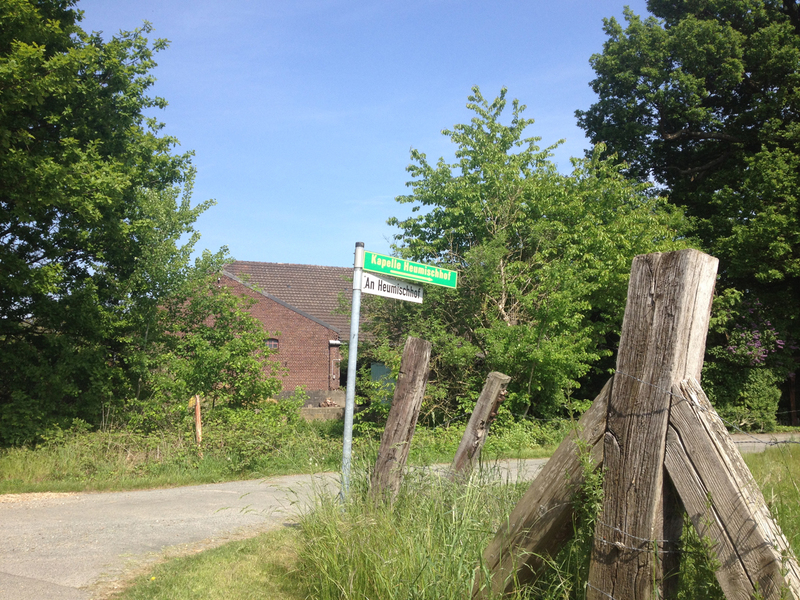 My Garmin had one church in Tönisberg but it became apparent very quickly that that church, the Evangelische Kirche, was not the only one – I could see a whacking great church spire which was not where my church waypoint suggested. No surprises, it was a large catholic church, which I visited next. 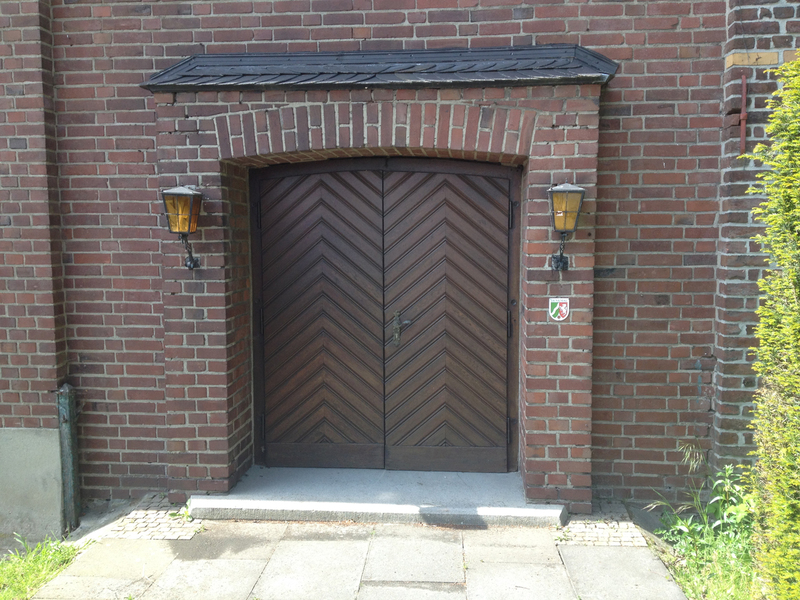 The Evangelische Kirche is tucked away down a quiet residential street with just a fairly small road sign pointing to it. It wasn’t even that obvious as the church tower was hiding behind a tree as you viewed it from the road. Up a bit closer it still looked a bit weird – like a bungalow with a strange concrete tower outside. And it looked as though it was built on top of someone’s house! I wondered if this was the house of the Pfarrer (the minister) but friend Anja told me it’s where the church caretaker/verger lives. The Pfarrer lives in one of the houses opposite. Despite having the church magazine for this church I couldn’t find out any information about its history except for a plaque on the front showing that it was built in 1974. 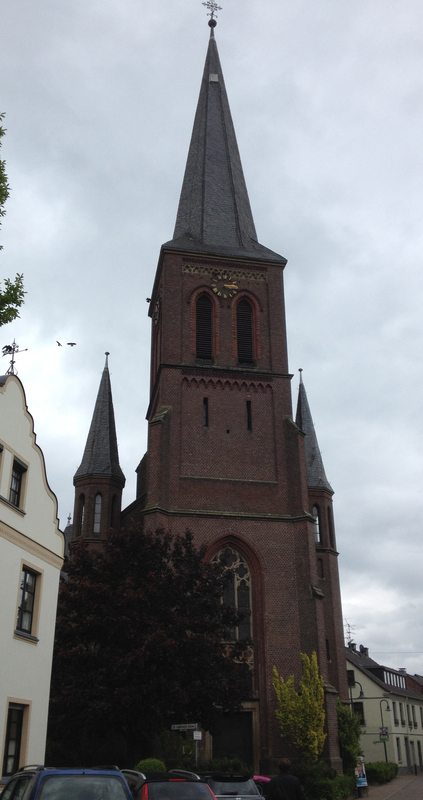 This is the church that was the owner of the large steeple I could see as I cycled into Tönisberg. It was yet another of these buildings that was so large, but closely surrounded by houses and shops, that you can’t really see the whole thing at once. 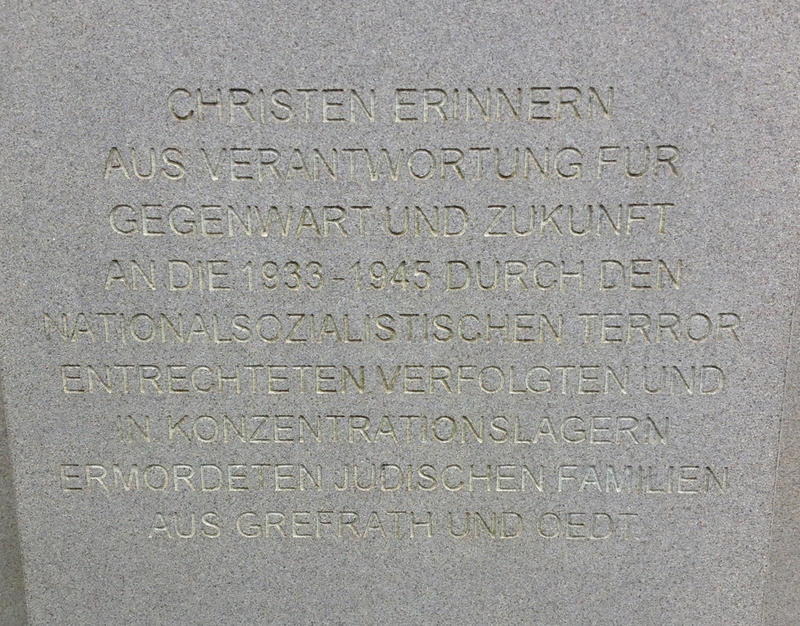 This history plaque was beside the front door to the church. 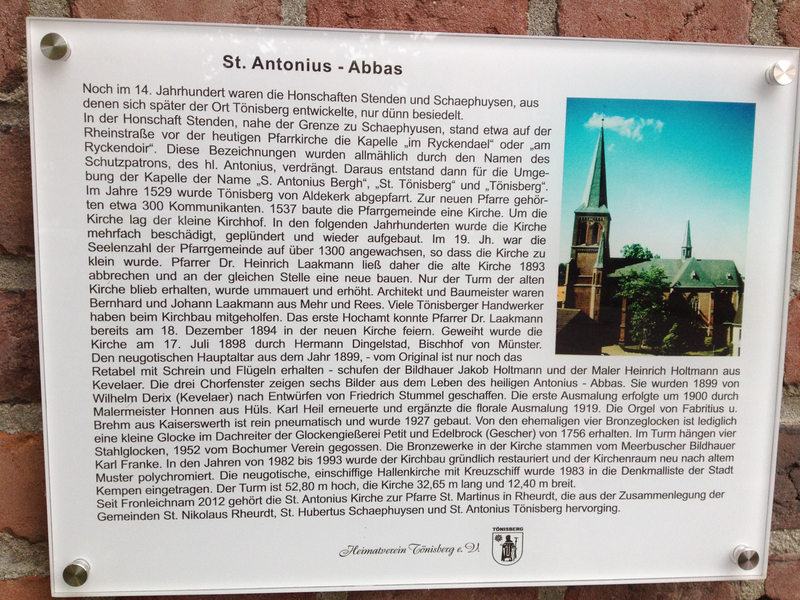 In summary, there had been various chapels in the general area linked with the name St Antonius from the early 14th century. The present church was completed in 1898. 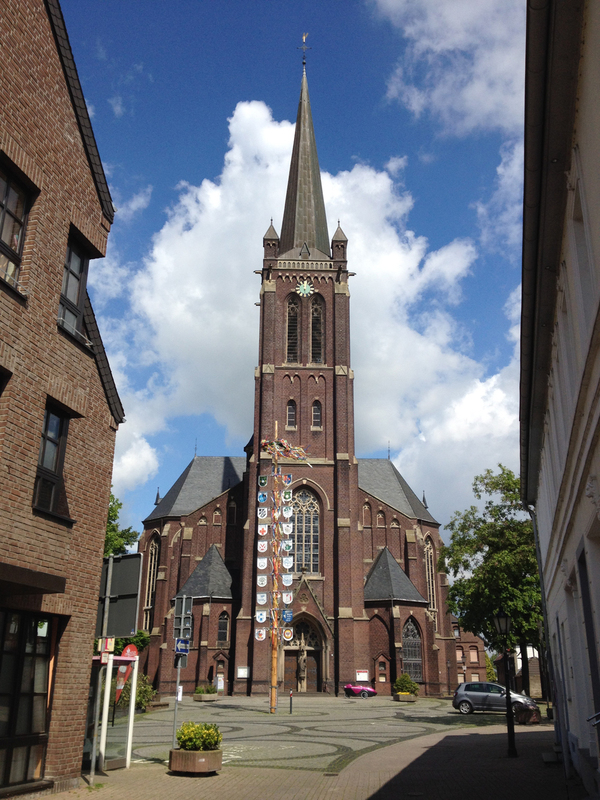 Reading the Wikipedia article on this church, it appears that in 2012 it ceased to have its own Priest and was joined in a group with the St Hubertus Schaephuysen and St Nikolaus Rheurdt churches. It was a shame I couldn’t look inside as I expect it is rather nice, seeing how high it is. The external view is rather dark and forbidding, however, with all the red brick. 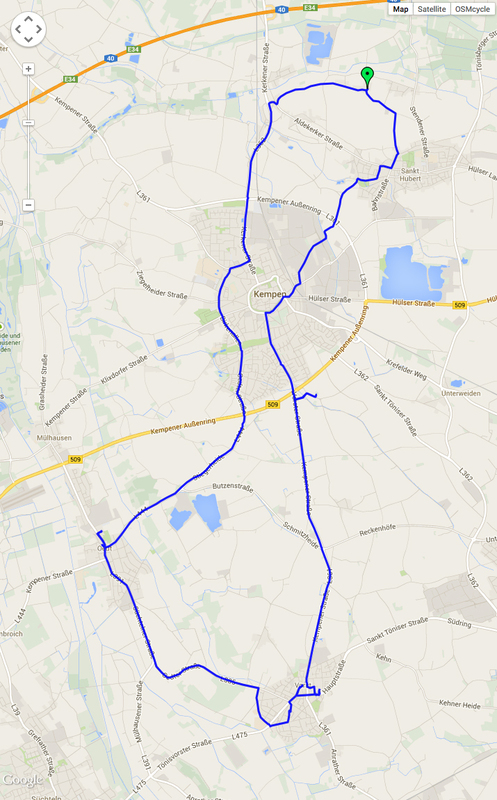 My route to Vinkrath went past Abtei Mariendonk (as usual), as I took the more northerly route on my outward journey. St Josef is a beautiful little church set in the middle of a small group of houses that makes up the hamlet of Vinkrath, barely 500 metres from the larger town of Grefrath. 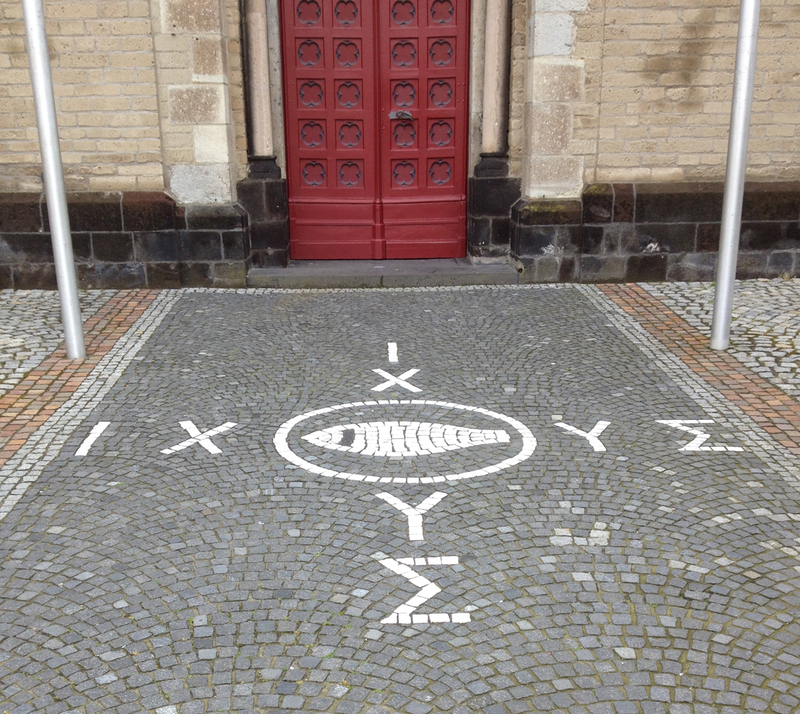 Die vergleichsweise kleine Josefskirche in Vinkrath mit der großen Rosette über dem Hauptportal weist eine interessante Innenraumgestaltung mit zahlreichen modernen Elementen auf. In other words, it’s got a large Rosette window above the main door and an interesting interior (which I couldn’t see as it was shut) which includes lots of modern elements. 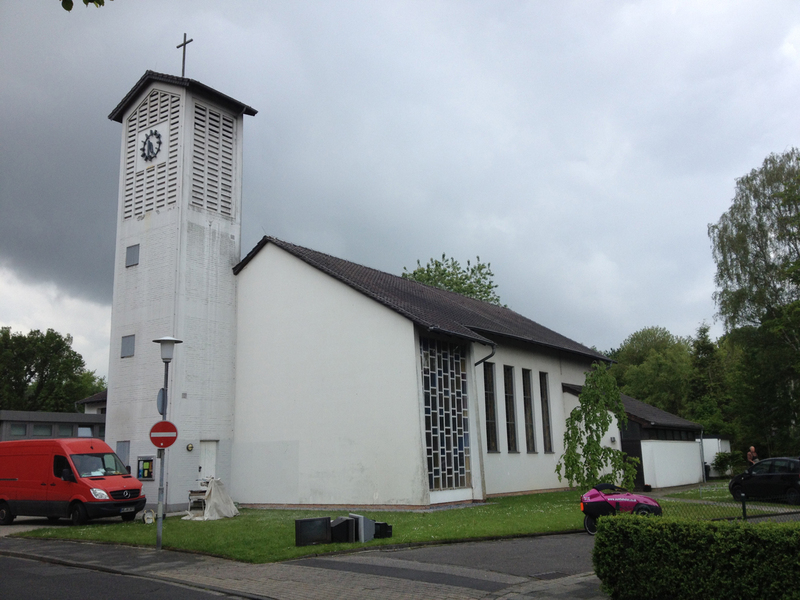 I could see on my Garmin another church listed fairly near so I headed off to it but it turned out to be one of the wayside chapels – I’m not including them on my Churches in Kreis Viersen challenge! 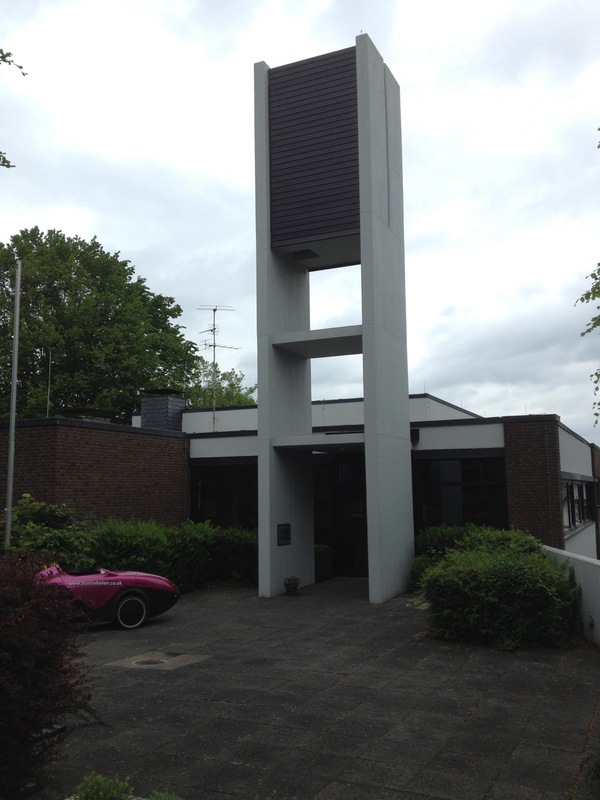 Another modern Protestant church of the Square-Edged concrete variety. The red van outside contained a workman eating his lunch and there was another chap doing building stuff around the side. I wandered to the main doors (to the left of the picture) and found, to my surprise, that they were open. 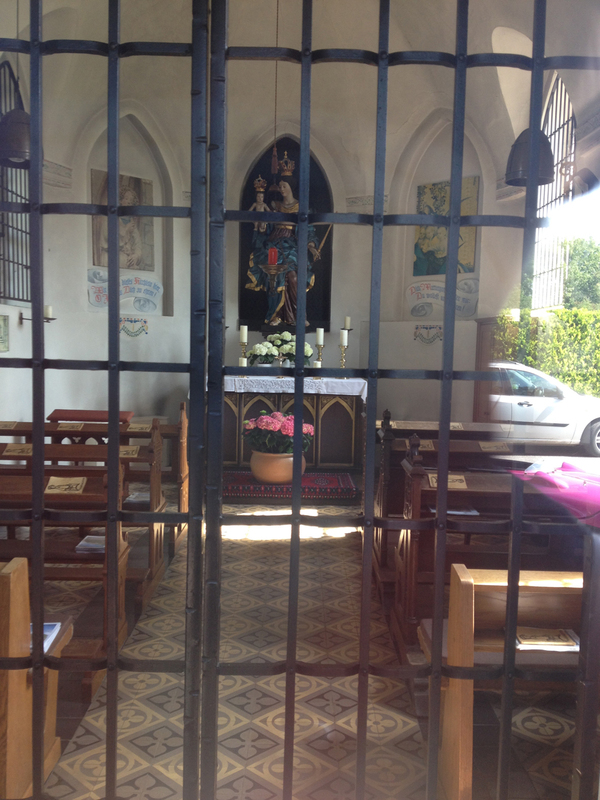 There was no-one about but I thought it OK to take a quick peep inside the church. 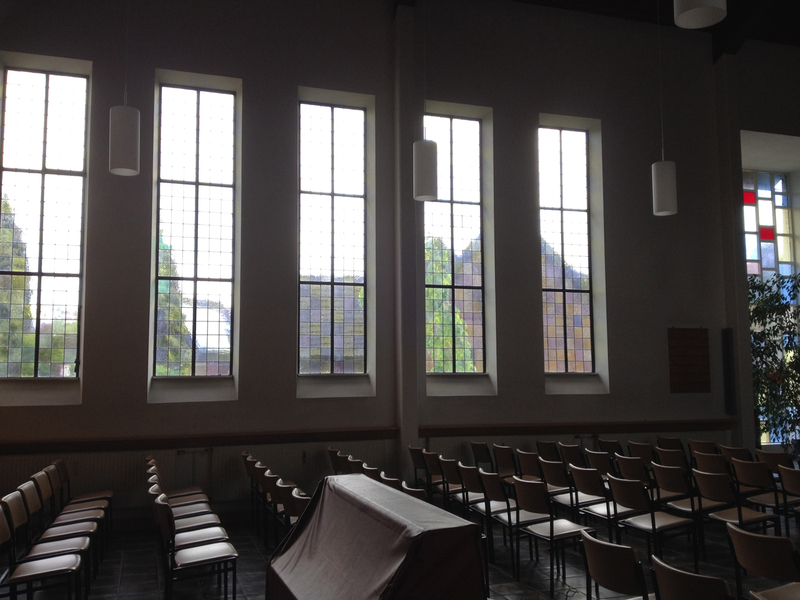 The stained glass windows were very pale – they let a lot of light in which was good with that very dark wooden wall at the front. 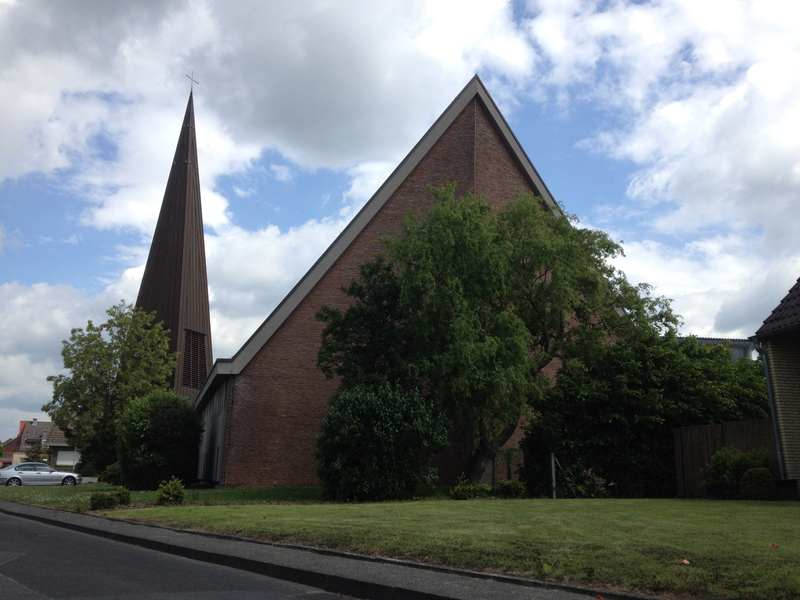 I was pleased to be able to see inside – I think most of these protestant churches are better from the inside with the coloured glass windows and other decoration; the white, blocky exteriors aren’t very appealing to me. This church is right in the middle of the pedestrian bit of Grefrath and it took me a while to work my way by bike to the front (there were steps from the side which I decided not to drag Penelope up). The church is the oldest building in Grefrath, parts of it being first constructed in 1492. It has a variety of different building styles – a romanesque tower of sandstone, gothic main church building and a 1960s extension of neo-romanesque red brick. I liked the Greek ‘Ichthus’ (fish) lettering as you approached the main doors. For those who aren’t aware of this, Ichthus was an early code word for Christians, with the letters spelling out the Greek words “Jesus Christ God’s Son Saviour”. It’s why you get fish plaques on the back of cars – usually cars driven badly! What really caught my attention, however, was a stone memorial around the side of the church. There was a Menorah (Jewish Candle) design at the top and then some further engraving. 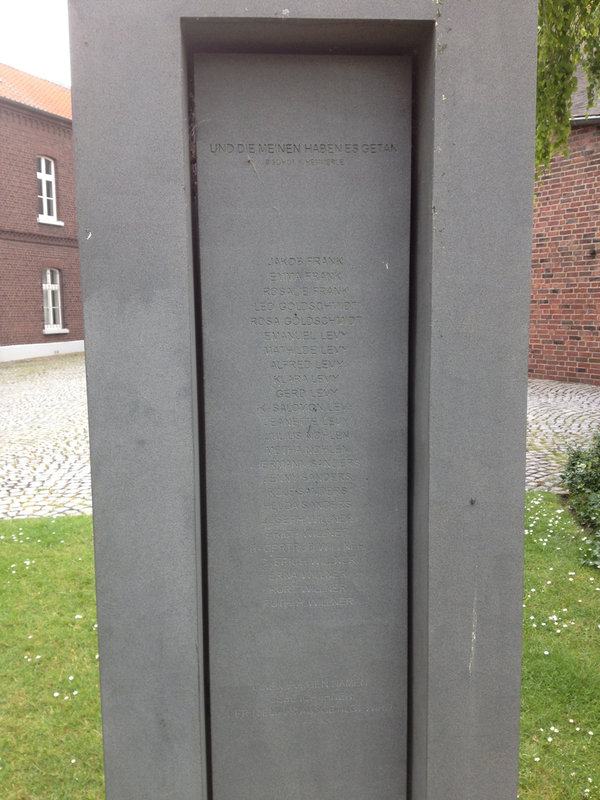 It’s a memorial to the murdered Jews of Grefrath and Oedt in the second world war. There was a list of names on the other side. I thought this was a very effective memorial and it is obviously used as a focal point for some memorial events, as this newspaper article from January 2014 explains. 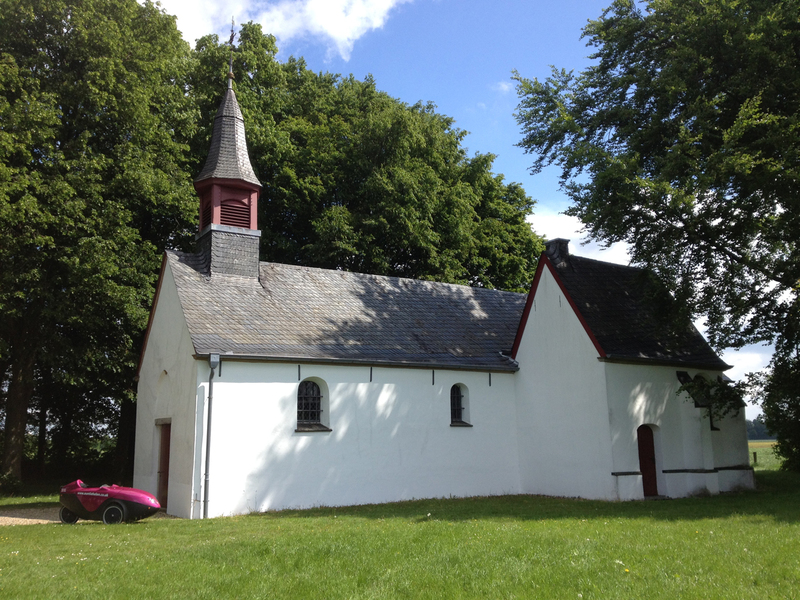 I visited this chapel (and the four churches following) on Tuesday 14 May, a day when the sun was shining and it was ideal weather for a little cycle ride. 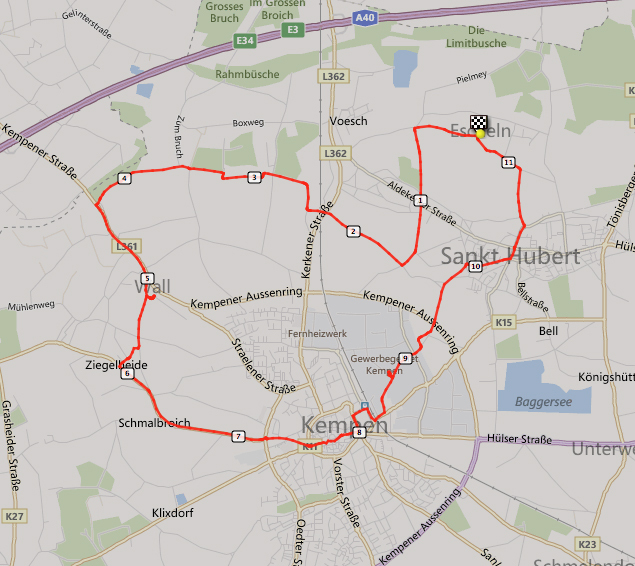 This is the route I took to visit this chapel in Kempen, two churches in Vorst and two in Oedt. I had been past this church before on one of my previous visits to the area, on the 17 March 2013, and had taken a quick photograph of it. Now was my chance to get a closer look. The chapel was shut, unfortunately, but there was a tall stone outside which had a fair bit of information. 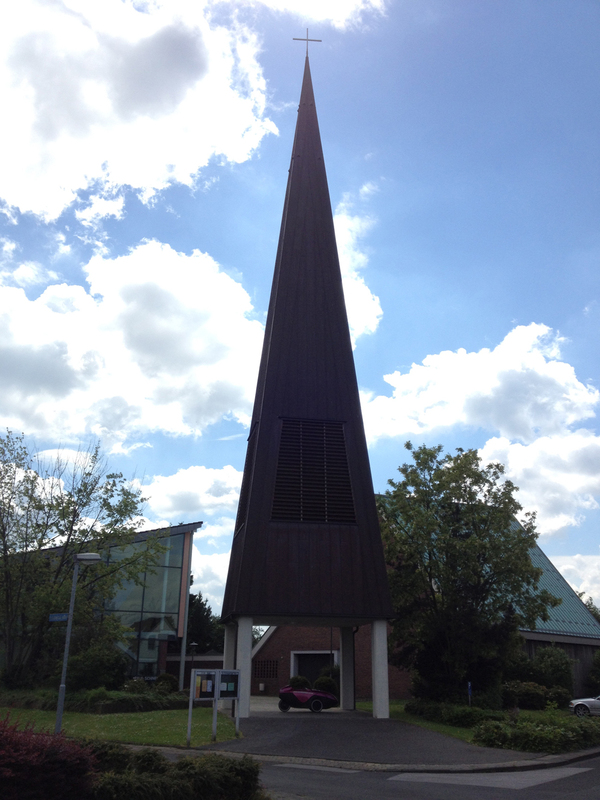 It explains that the Chapel of St Peter is the oldest church in the Kempen area. 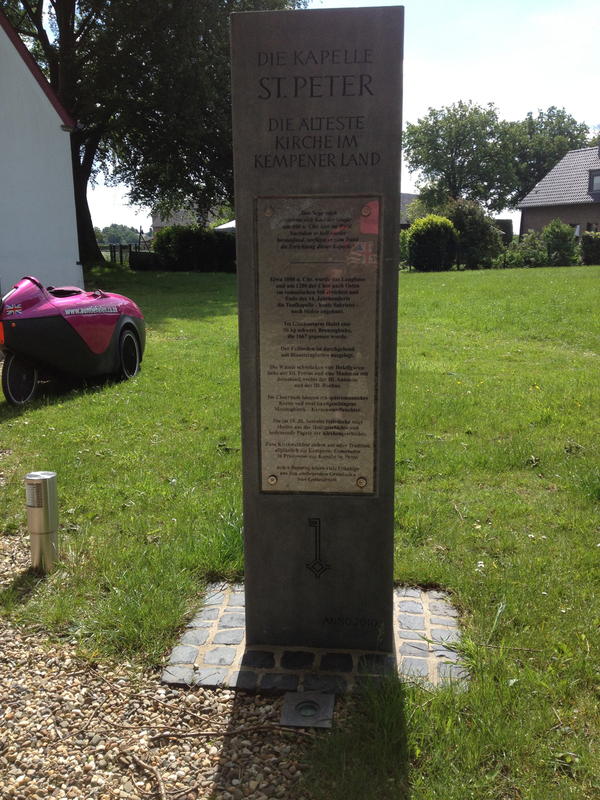 The plaque goes on to explain that, according to legend, Charlemagne got lost around 800 AD in the woods here. 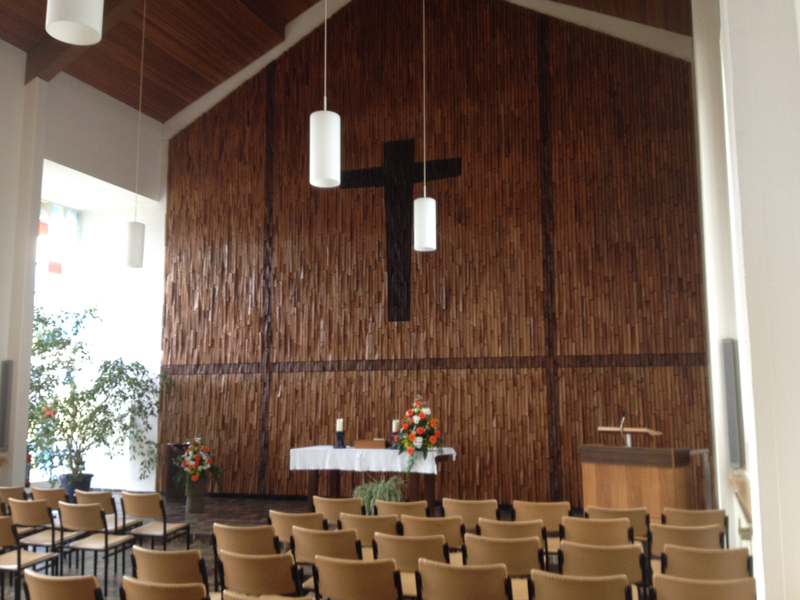 After he found out his way out again, he ordered the building of this chapel. Around 1000 AD the main body of the church and the east Choir were built in romanesque style. At the end of the 14th century the baptism chapel (today the sacristy) was built to the south. In the belltower there’s a 50kg bronze bell that was poured in 1667. There’s a bit more information about the interior and then the plaque finishes with the words “Every Sunday many believers from the local area celebrate Mass here” – it was nice to know that this chapel was still in use as several of the others that I’ve visited are no longer used for services. 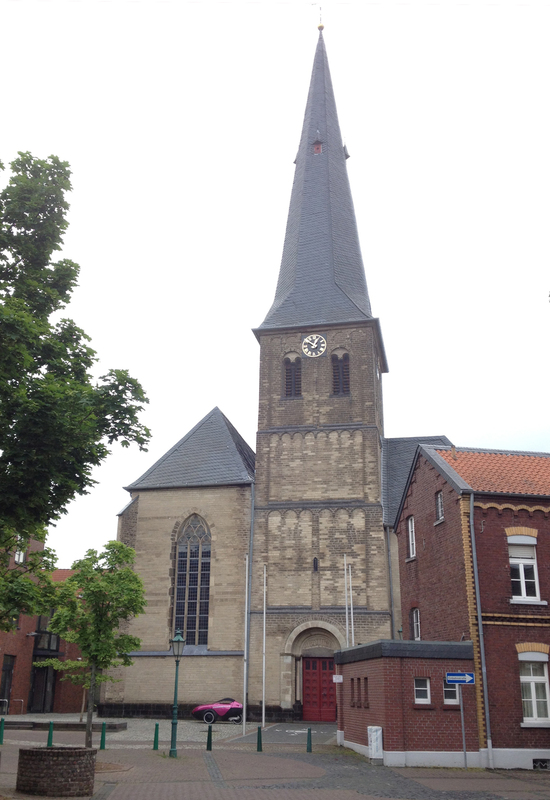 This church is fantastically situated right in the middle of Vorst (as one might expect) but, as a bonus, there is a road directly opposite it so it means I was actually able to take a photograph of the entire front façade of the church for once! The church was closed but there was a very nice bakery next to it so I went and had a slice of cake and chatted to several locals. According to the website of this church, it was built in the neogothic style in the late 19th century. The cross-shaped main sanctuary is 40 metres long and 20 metres wide and there is space for 2,100 people. The tower is 75 metres high and there are 100 steps up to the balustrade. 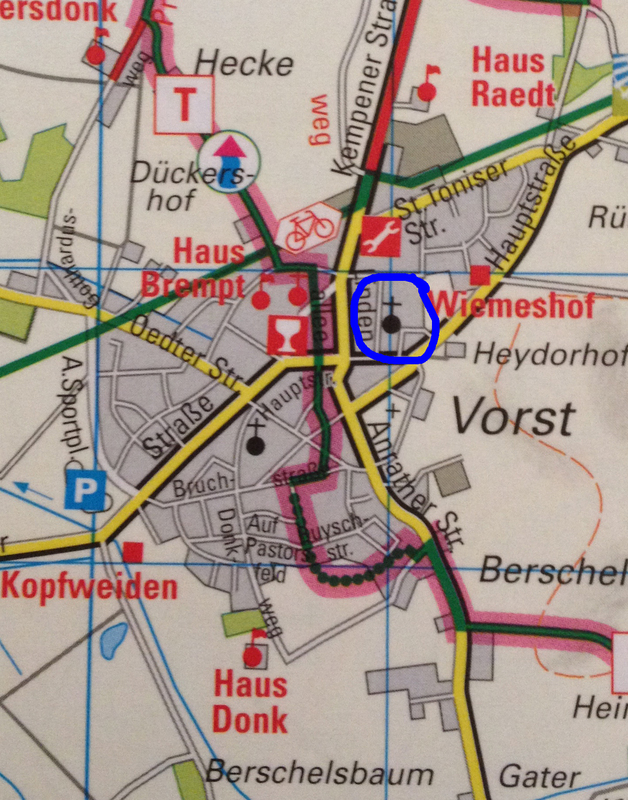 To the left of this (above the cup icon) is the red church symbol for St Godehard, the black church symbol to the south-west is the Evangelical church that I visited next (number 20 below) but I couldn’t find any sign of a church at this location slightly to the east of the centre. All I could find was a school there – and my Garmin (which has its own list of Points of Interest from OpenStreetMaps) didn’t have a church listed in this place. So it’s either a map error or a church that has been knocked down and turned into a school (mind you, the school didn’t look that new). 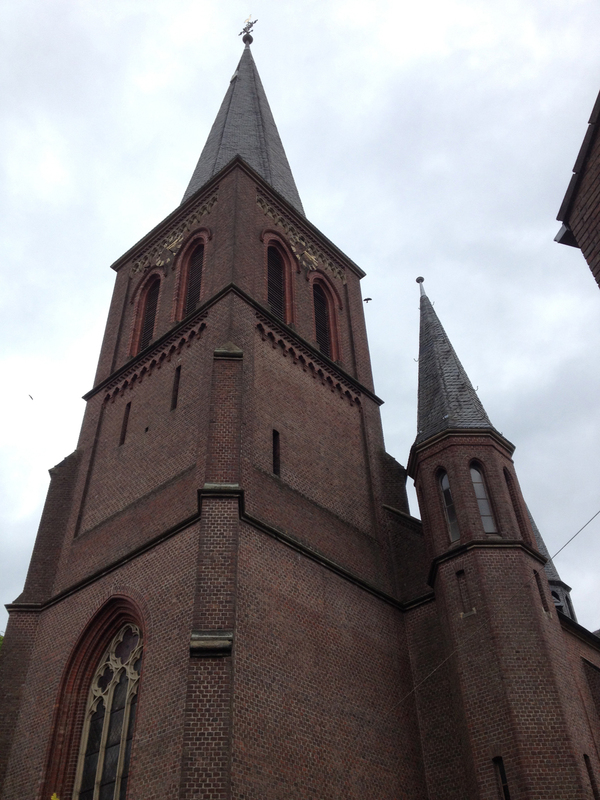 Mystery unsolved, I headed off to the next church in Vorst. This was yet another Evangelical church tucked away in a housing area but, rather unusually, it wasn’t painted white but was instead of red brick. 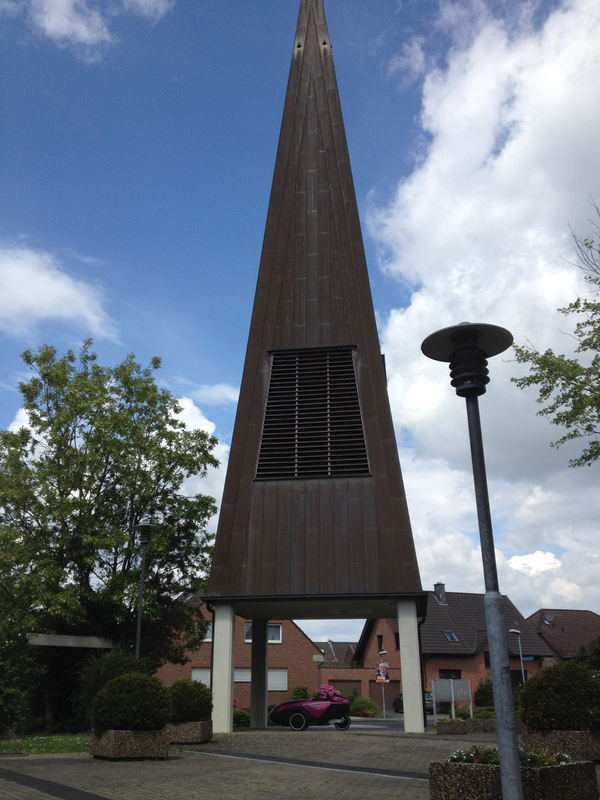 It also had a rather dramatically unattached spire. It was extremely difficult to fit the whole thing in a photograph – I just about managed here. 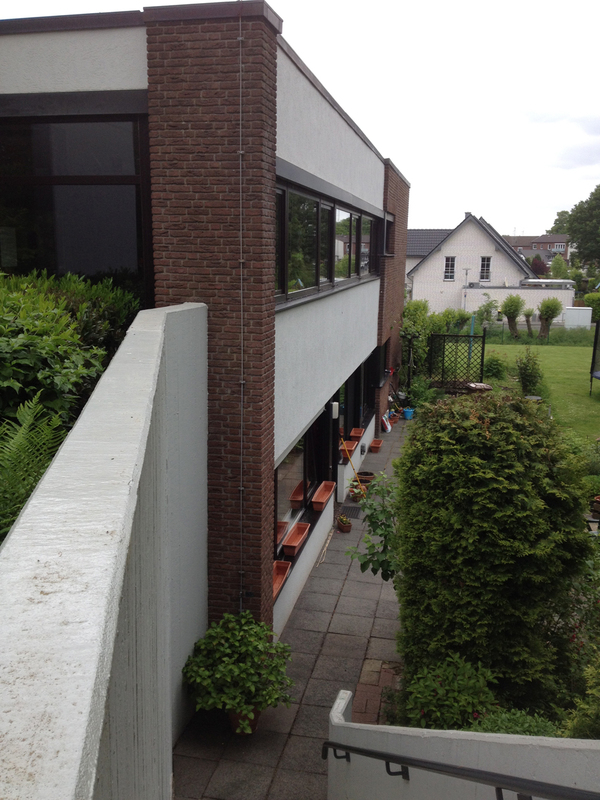 This was from the other side – better light but no chance to fit the whole thing in; I had my back to the wall of the neighbouring CVJM building (a German YMCA). The website for this church is being changed so there was no information about it available. 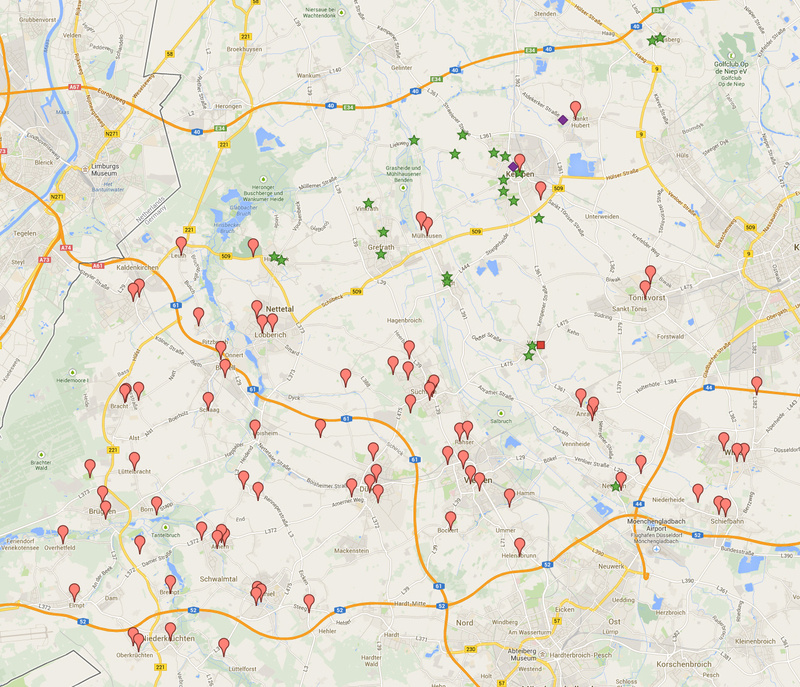 Below is a screenshot of my Google Maps document with all the churches to visit (red symbols). Green are those visited, purple diamond is a church visited and which I’ve actually attended a service in, and pink square is a church I couldn’t find (the one in Vorst today). Bearing in mind that I live at the top right hand side of the map (near the purple diamond of St Hubert) I’ve got some quite long cycle rides to visit some of the churches at the bottom left hand side in due course!